is a narrow and dramatic glacier carved canyon with family and group campgrounds located along Big Pine Creek. 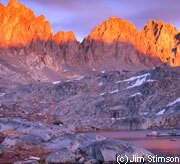 Hiking trails into the John Muir Wilderness lead to numerous lakes, streams, and high peaks. A pack station and resort provide public services. Big Pine Canyon is also the home of the Palisade Glacier. The largest of the glaciers in the Big Pine area of the Sierra, Palisade Glacier, is estimated to be about two miles in length and several hundred feet thick. TRAILHEAD ELEVATION -7,800 ft. at roads end. Located near Big Pine, California, this trailhead is located off of HWY. 395, turn west on Crocker Street in Big Pine and continue approx. 10 miles up canyon to end of road. Day use parking is at roads end. Overnight parking is located about 1/2 mile below end of road in hiker parking lot. Big Pine Canyon also has a campground. The North Fork trail offers access to Big Pine Lakes and the Palisade Glacier, the largest glacier in the Sierra. The Palisade Crest rising above 14,000 ft. contains some of the finest alpine climbing in California. The Big Pine Lakes trail zigzags through a slope of sage, manzanita, and Jeffrey Pine before it reaches second falls and follows along the creek to its headwaters. The flowers in early summer are abundant along the path leading into the canyon. Hikers will pass a stone cabin built by movie actor Lon Chaney while walking through a forest of Lodgepole pine. A junction in the trail will go up to Black Lake, where splendid views of the Palisade Glacier and Crest can be seen. The trail from Black Lake will rejoin the main trail near 4th Lake. Following the main trail will take hikers along past Lakes 1, 2, & 3. Third Lake is fed directly from the Palisade Glacier, which causes its milky turquoise color from the glacial powder carried down from the melting glacier. The imposing dark mountain above 3rd Lake is Temple Crag, Fishermen can find rainbow trout in most of the lakes in the canyon with the higher lakes containing golden trout. Be sure to carry out all empty bait containers and trash while hiking or fishing. The trail to the Palisade Glacier is about 1/2 mile above 3rd lake. Turn left and follow switchbacks up among grassy benches and boulders to Sam Mack Meadow. Whitebark Pine survives the climate up high with several types of alpine flowers growing on the seemingly soil-less area. About the last 1/2 mile to the glacier requires much boulder hopping and the trail is very obscure. Hikers can meander safely along the lower part of the glacier where the slope is gentle, but should avoid the upper reaches unless well experienced on ice and snow. The South Fork trail (an obscure footpath) climbs up beneath the jagged peaks of the Middle Palisade Crest and gives access to the Middle Palisade Glacier. Along the trail are a few gnarled Limber Pines growing on the steep slopes below Willow Lake. The few lakes in this drainage contain both Brook and Golden Trout. The trail above Willow Lake becomes indistinct with rock ducks marking the way to the upper lakes. The Baker Creek trail is now seldom used, for the creek can be reached by a jeep road from Bishop. This trail provides spectacular views of the Palisade Crest. It takes in the canyons of both forks of Big Pine Creek. The trail starts at a junction off the N. Fork trail. There it crosses a ridge and winds through a stand of Jeffrey Pine that had been logged back in the 1880's, It then climbs past Grouse Spring to a high point on a gentle ridge where views of the Middle Palisade and Disappointment Peak tower above the glacier. To the north, Mt, Sill (14,162) and the North Palisade (14,242) loom over the Palisade Glacier. Further north, are the high rolling meadows of Baker Creek and Coyote Flat, a remnant of an ancient plain that existed before warping and faulting formed the mountains of the Sierra Nevada.